When we first started homeschooling, I found Home School in the Woods when looking for a timeline book, which Bookworm still uses three years later. Then, we had the privilege of reviewing several of their products–Project Passport World History Study: Renaissance and Reformation and HISTORY Through the Ages Hands-on History Lap-pack: U.S. Elections–which we loved. 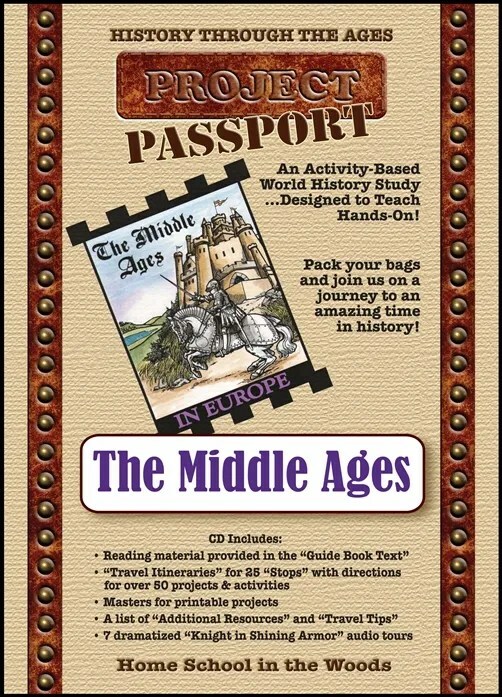 This year, we tried HISTORY Through the Ages Project Passport World History Study: The Middle Ages, and it was every bit as wonderful as the other products we’ve tried! We received this item as an electronic download. Like other Home School in the Woods products, you’ll need certain supplies to get started. I still had different colors of card stock and paper from last year when I used another Home School in the Woods product, so I was good to go. While the initial investment of buying the card stock and colored printer paper may be a bit pricey, once you have the materials, you can continue to use them for other Home School in the Woods products. I downloaded the material and got to work. There are 25 “stops” in The Middle Ages program. This curriculum is suitable for kids in grades 3 – 8, though I did use it, with modifications, with my younger two who are in 1st and 2nd grade. Home School in the Woods recommends that the curriculum take 8 to 12 weeks. This can serve as a complete history curriculum, but you can also use it to supplement your current history curriculum. As a supplement, you could stretch the material out for the entire year. There are usually several pages of text about the historical period also. For example, Stop #20 has two pages of text that explain who the Vikings are and how they battled. Stop #21 has three pages of text explaining why the Vikings traveled and settled in new lands. For previous Home School in the Woods items, we’ve started at the beginning and worked our way through. This time, we did something different. When we got the review, the girls were studying the Vikings, so we jumped right to stop 20 and 21, which covers the Vikings. This product worked as a great supplement to our learning. The girls created a Viking longship, which they didn’t complete because they thought it was easier to play with as is, without the oars and the mast. They also listened to an audio portion about living in a Viking settlement. Then they created part of the lapbook that explained what life was like in a Viking settlement. Since the girls are a little younger than the recommended age for this product, we skipped some of the activities such as creating newspaper articles. But the fun thing about this product is that when the girls cycle around to this time period again in their studies four years from now, they’ll be able to use The Middle Ages again and complete all of the activities. Bookworm also used this product. He jumped to stops 14, 15, and 16 to learn about religion in the Middle Ages as part of his religious studies. He worked on several projects and spent so much time on intricate details for the art work that I counted it as art class, too! Next year, Bookworm will be studying the Ancients, so I’m delighted that the next project in the works for Home School in the Woods is Ancient Rome, which will be out next year. Just in time for our studies! I can’t gush enough about these products. Why? They bring history to life, which is great if you have some kinesthetic learners like I do. Second, this product is very reasonably priced. The Middle Ages download is currently $33.95. For that low price, it can be used by all of your children, and it can be used more than once during your child’s elementary and middle school studies. Third, this product encompasses many subjects including writing and art in addition to the obvious, history. Fourth, when students finish the entire product, they have a keepsake that they can look back on and review their history. I was one of 100 people to review either The Middle Ages, Ancient Greece, Ancient Egypt, or Renaissance & Reformation. Click on the link below to read other reviews.